This page contains all of the posts and discussion on MemeStreams referencing the following web page: Barbie Becomes an Authentication Device for Pre-Teen Friendship | Threat Level. You can find discussions on MemeStreams as you surf the web, even if you aren't a MemeStreams member, using the Threads Bookmarklet. 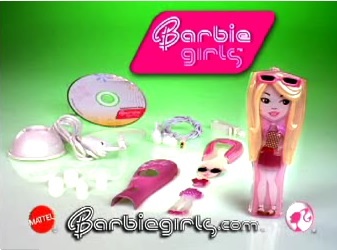 The idea is, Sally brings her Barbie Girl over to her friend Tiffany's house, and sets it in Tiffany's docking station -- which is plugged into a USB port on Tiffany's PC. Mattel's (Windows only) software apparently reads some sort of globally unique identifier embedded in Sally's Barbie Girl, and authenticates Sally as one of Tiffany's Best Friends. It's sort of like an RSA token, but with cute fashion accessories and snap-on hair styles. THREAT LEVEL foresees a wave of Barbie Girl parties in the future, where tweens all meet and authenticate to each other -- like a PGP key signing party, but with cupcakes. As far as that goes, it's time has come.. Without the device, girls can only chat over Barbie Girls' standard chat system, which limits them to a menu of greetings, questions and phrases pre-selected by Mattel for their wholesome quality. In contrast, Secret B Chat lets girls chat with their keyboards -- just like a real chat room. But it limits the girl-talk to a white list of approved words. "If you happen to use a word that's not on our list (even if it's not a bad one), it will get blocked," the service cautioned girls at launch. "But don't worry -- we're always adding cool new words!" OMG, no lolz? This could be really strange. If the tweens of America are forced to use nothing but proper english, rather than talk about only proper things, I think they will develop strange codes. This product was covered in the Times and on HBR IdeaCast #56 back in July; it didn't occur to me to meme it, although I did mention that I found the book, Smart World: Breakthrough Creativity And the New Science of Ideas, to be somewhat hokey and lacking in context. Now, four months later, the echoes of the story are being reinterpreted as some kind of latent victory for long-view cypherpunks. Highly dubious. I am confident that a cursory examination of said product will reveal that the embedded data is in no way "like an RSA token", and that there is in fact nothing cryptographically significant going on here. I suspect one could demonstrate a Best Friend cloning/spoofing tool without too much effort. I haven't read the user manual, but this product could be considered to encourage pre-teens to engage in unsafe docking behavior. With minor modifications, one of these dolls could introduce malware onto the systems of unsuspecting Best Friends. It's not the first time Mattel has tried to connect toys to the Internet. But the company made mistakes in its previous attempts. Those mistakes contain important innovation lessons that all managers can and should remember. In the late 1990s several companies, Mattel among them, came up with toys that could interact with an online world ... What doomed these products was not defects in conception or execution so much as the fact that Internet connections were just too slow and clunky. As Louise Story noted in her New York Times article “Barbie Gets Another Accessory”, there is an important new phenomenon, in addition to broadband connectivity, showing up that underlies the rush to link toys to the online world in this second round. Kids no longer distinguish between “real” toys and games and virtual ones. As I point out in Smart World: Breakthrough Creativity and the New Science of Ideas, businesses often get stuck in a dominant "idea-space" (e.g., websites = advertising), and are slow to see the creative opportunity offered by an emerging space (virtual play online = real-life play). Agreed. I wonder if we could market a cloning device for boys as a way to screw with their little sisters. I'm still waiting for a buy button on my remote control. Whats really sinister about this is that Barbie is getting children used to a world in which Internet censorship and electronic IDs are common place while these children are too young to think about it. My first impression of the online world involved a BBS where I made the rules. People who grew up with this kind of heavily controlled interaction, which later graduates into net-nannies and surveillance tools which inevitably give mom and dad access to our social network profile and emails... well perhaps they'll think nothing of warrantless government surveillance or government censorship of Internet conversations. It will be something that has been a part of their life from the very start. To them an Internet in which Barbie isnt cutting out the bad words will seem alien... Some sort of distopian nightmare fuelled by liberal ACLU sympathizers whose real goal must be to establish a national communist regime. I can only hope instead that the experience of trying to carefully pick words that Barbie allows is so clunky and annoying that the girls are instead taught a lesson in how stupid and arbitrary authority can be. That by the time they're 16 they've figured out how to hack their way around the net nannys and they can't wait to reach the age of majority when no one will be able to foist that kind of crap on them anymore. I would happily accept the irony of a generation of female hackers brought about by Barbie.